I express in Peter first of all his great humanity shown in the sensitive concern he has for his own emotional and idealistic vulnerability as well as his tight grip on the immense task laid upon him. I see him also as a man of our times, for he is still with us through the sacred succession of popes as expressed in the dome of Saint Peter’s and columns of his basilica in the background. He is dressed both as a fisherman and a priest with both his hood and stola shown against the sea where he fished. He holds the shepherd’s staff with the first ambo from which Jesus preached, which was Peter’s boat. Also on the staff is planet earth, God’s sacred creation we call home. And of course the keys to heaven and the Holy Spirit evidenced in the wind of his garments as he stands upon the rock of Christ’s church which I have placed emerging from the sea of time and human history, and resembling somewhat the surface of the human heart. 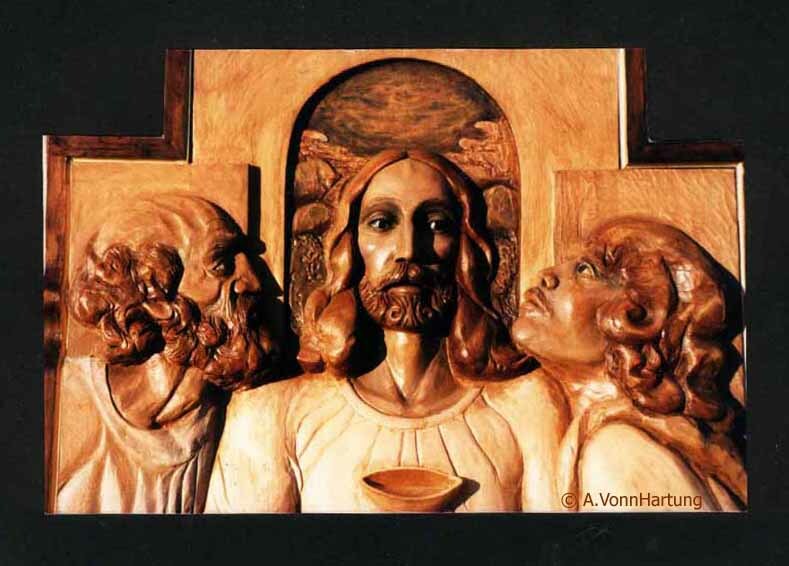 This high relief wood sculpture (12-inches x 33-inches x 3-inches) is one of six saints carved by A.Vonn Hartung for the Ambo of St. Paul’s Catholic Church in Pensacola, Florida, commissioned by Pastor Doug Halsema through Liturgical Consultant Dr. Steven Schloeder of Liturgical Environs. The carvings considered as a group: Because Christ is present in His own word in proclaiming the Gospel the carved figures of the saints Peter, Paul and the Evangelists are all directed towards the center of the Ambo. 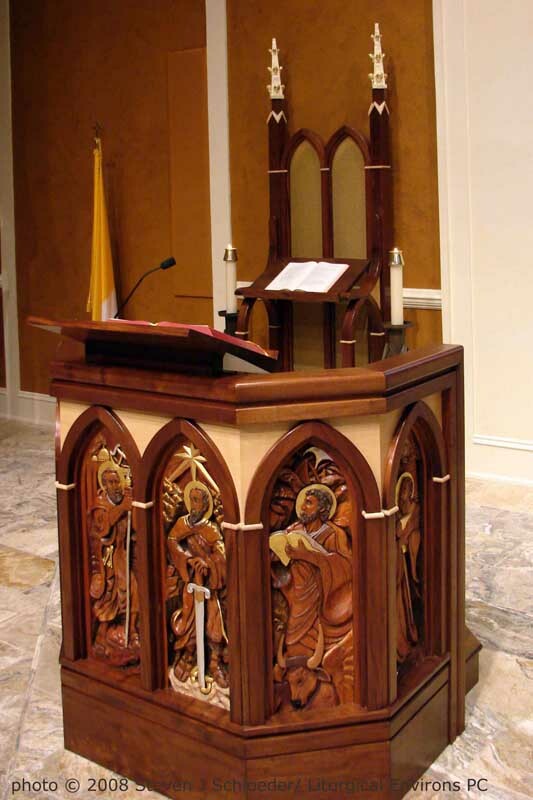 It is as if they are again listening to and reliving the truth and reality of Christ Jesus that because of them and through them the gift of the Holy Spirit continues to live in us in the Liturgy of the Word. Six Carved Saints is a video of the artist explaining the symbolism of the six carvings. Vonn, Your work is stunningly beautiful. St. Peter is so lifelike and emotional. You are indeed blest. St. Paul’s Church is fortunate.